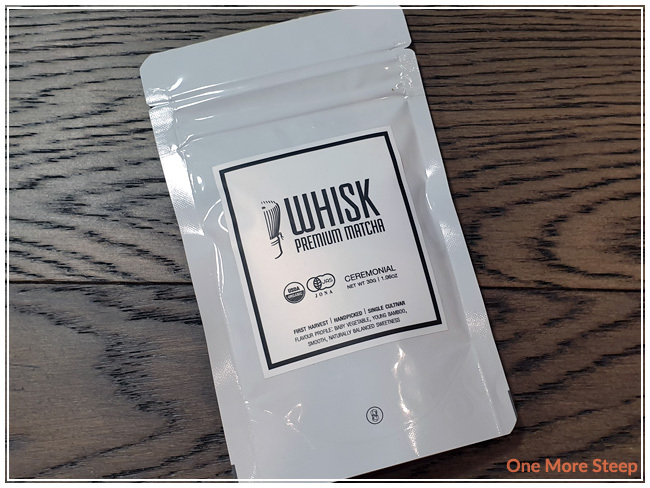 Whisk Premium Matcha has provided me with Ultra-Premium Organic Ceremonial Matcha for the purposes of providing an honest review. Ultra-Premium Organic Ceremonial Matcha came in a sealed, resealable, foil pouch. The front of the package gives a bit of information regarding the flavour profile (baby vegetable, young bamboo), as well as the fact that this matcha is from a first harvest of handpicked tea leaves from a single cultivar. Ultra-Premium Organic Ceremonial Matcha is from organic tea farms located in Uji, Kyoto, Japan and is a 100% pure, organic matcha. 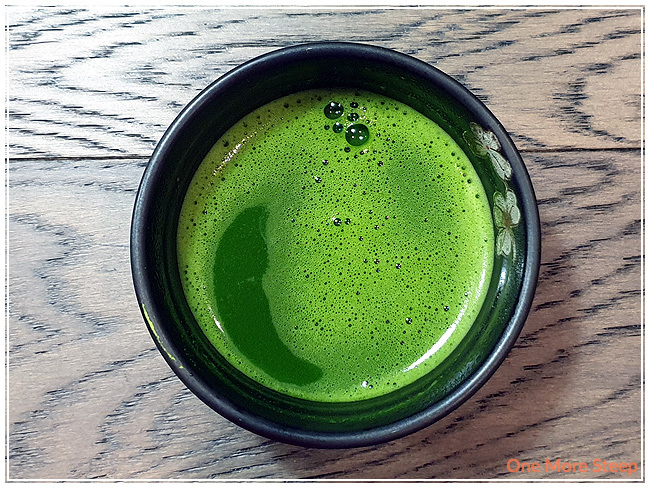 The colour of the matcha is amazing – the green is so vibrant and bright. I find that it has a slight vegetal aroma that reminds me a lot of raw bok choy with slight mineral undertones. Unsifted Ultra-Premium Organic Ceremonial Matcha. There were no preparation instructions on the packaging, but Whisk Premium Matcha’s website has a Matcha Preparation page. I used 2 bamboo scoops of Ultra-Premium Organic Ceremonial Matcha and sifted it into my bowl. I used 175°F (79°C) water and whisked the matcha in an M motion until there was a layer of bubbles. Sifted Ultra-Premium Organic Ceremonial Matcha. 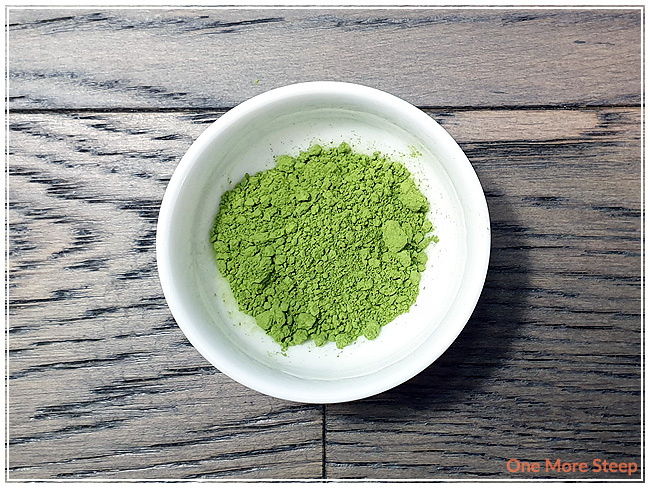 Ultra-Premium Organic Ceremonial Matcha is such a vibrant green, it’s almost unreal. I took a sip after whisking this matcha and found it had a beautiful light sweetness to it. The flavour reminds me of dark leafy vegetables (spinach, Shanghai bok choy, gai-lan/Chinese broccoli) – it just had that familiar bite to it. There are some definitely strong grassy notes and lots of umami flavours to it. A lot of the time, especially for green teas, I find that the umami to be a bit strong for me, erring on the heavily salty side but the umami that I taste in the Ultra-Premium Organic Ceremonial Matcha is well-balanced with the lighter sweetness that’s also present – which just made it very pleasant. 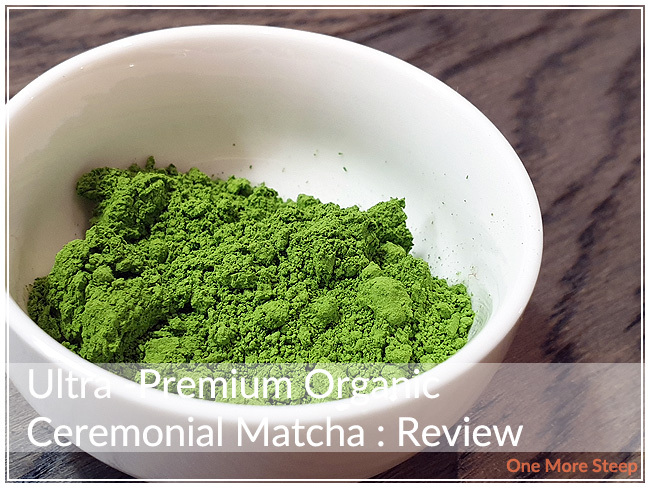 I found that Ultra-Premium Organic Ceremonial Matcha has a lovely smooth texture to it. I had this matcha straight. As matcha is a suspension, there was no second steeping since it was all used up in the first whisked bowl (and went into my belly!). I loved Whisk Premium Matcha’s Ultra-Premium Organic Ceremonial Matcha. I found that the flavour profile was well balanced and quite complex. 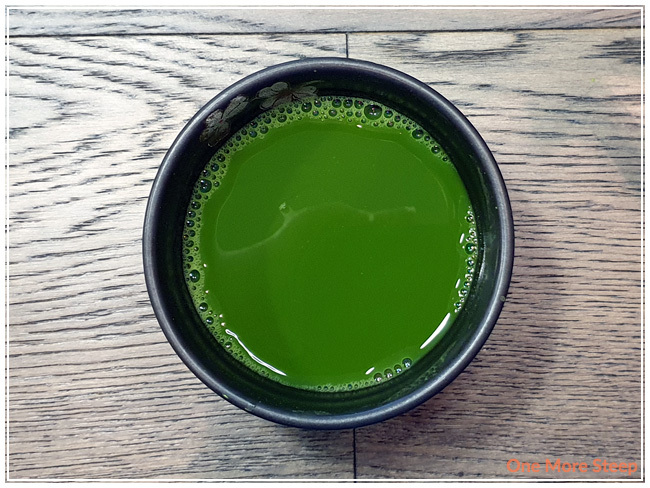 The subtle changes from grassy to vegetal to grassy again, with strong umami notes that were balanced against the gentle sweetness that I found in this matcha was a delight for the taste buds. 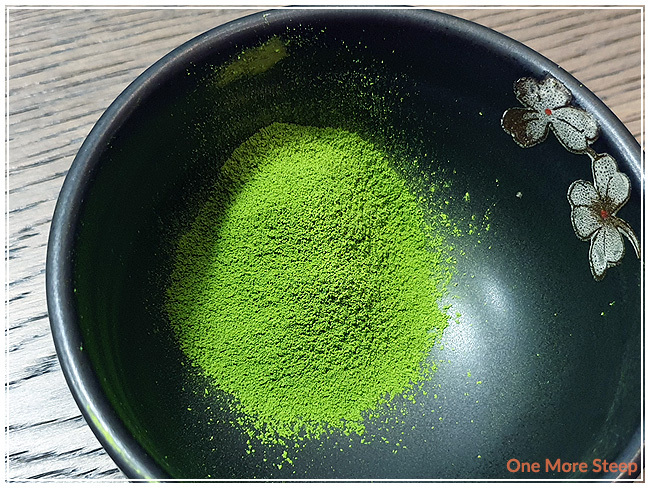 I find the steps of whisking matcha to be really relaxing, so that was a nice added bonus of trying out the Ultra-Premium Organic Ceremonial Matcha – it put me in a good mood prior to drinking it. Sometimes I like to pat myself on the back for actually remembering to post about matcha on a Monday for #matchamonday – although I am aware that I may be the only one who cares about this. 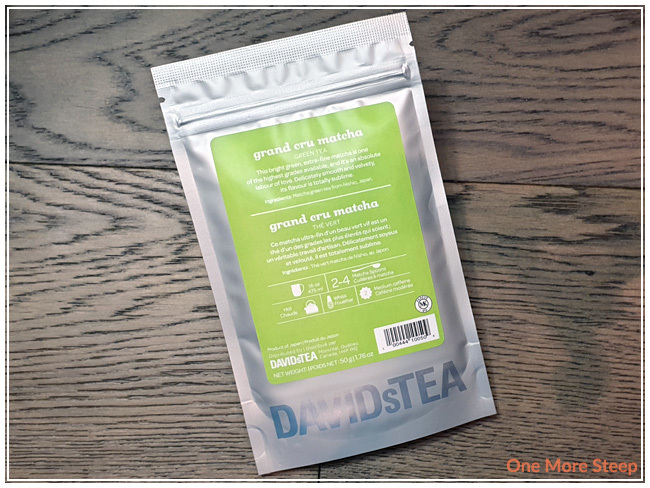 Grand Cru Matcha from DavidsTea is one of the pricier matcha options from this Canadian tea company, I actually got mine through the Frequent Steeper program ($100 in purchases → 100 points → 50g of any one tea, with some exceptions). Grand Cru Matcha comes in a sealed, resealable foil bag. Because it came with an online order, instead of me going out to the closest local retail location, it came with a coloured printed label. 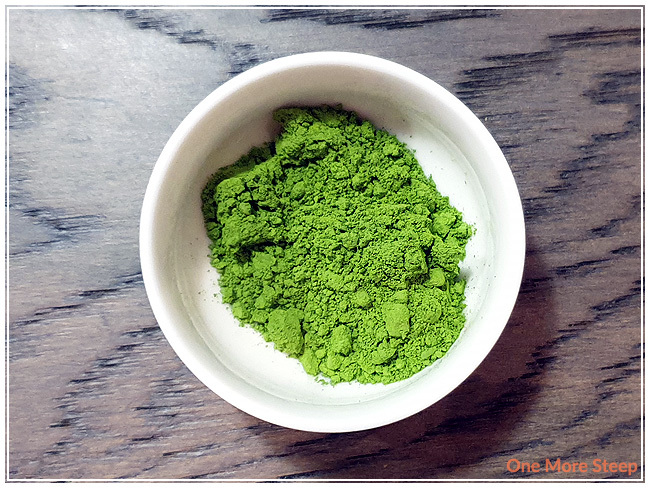 Grand Cru Matcha is a lovely bright green powder, it has a strong grassy aroma to it. This straight matcha consists only of matcha green tea from Nishio, Japan. A little internet search tells me that Nishio is the largest producer of matcha in Japan. The packaging for Grand Cru Matcha recommends steeping tin hot water, and preparing with a whisk. On the product page of DavidsTea’s website, the recommendation is to whisk the matcha with 75°C (170°F) water. The lowest temperature my Breville IQ Kettle goes to is 175ºF, so I allowed the water to cool for approximately 5 minutes before whisking. How I typically prepare matcha is to sift the powder, and then whisk with a small amount of water. After it’s well whisked with a frothy top, I add water to thin it out since I don’t like my matcha too thick tasting. When photographing for this review, I forgot to take a photo of the matcha when it still had to froth, so instead I have a photo of after adding water to thin it out. Grand Cru Matcha is a darker green once whisked. The aroma from the matcha is mostly grass with some vegetal notes. 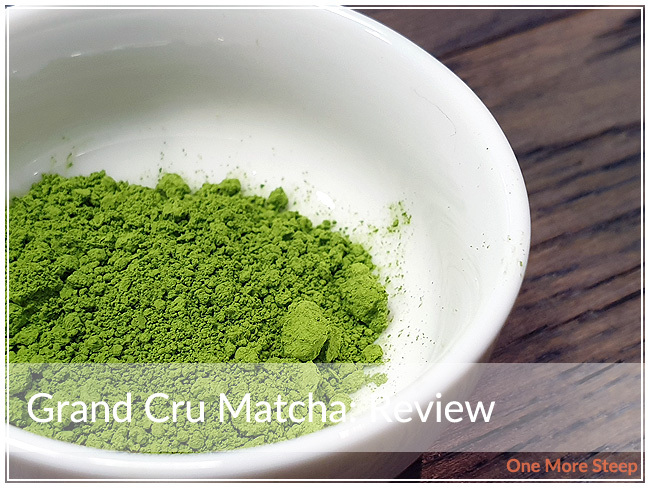 The flavour of Grand Cru Matcha is a mix of salty, grassy, vegetal flavours (reminds of me spinach, to be honest! ), with some umami notes. There’s a pleasant smoothness to this matcha that makes it goes down easy. If you’re not a fan of the umami/salty notes, you can always add a bit of sweetener when turning this into a matcha latte. I’ve also seen some posts online about mixing Grand Cru Matcha with some lemonade for a bit of a summery drink! Grand Cru Matcha, like other matcha, is a suspension, so there are no repeat steeps! I loved DavidsTea’s Grand Cru Matcha. There was something zen-like about the process of me preparing this matcha, and then drinking it was a little adventure in itself. I love the act of sifting and whisking matcha, it’s just a lot more involved than simply steeping a cup of tea – although there’s nothing wrong with that either. Grand Cru Matcha has a lovely flavour balance of grassy, umami, and vegetal notes that I think a lot of people who enjoy matcha would like. It is on the pricier end of DavidsTea’s tea selection, so it may be a good idea to get to a store to get a smaller amount or use a redemption reward on it! It’s the season for holiday baking, work cookie exchanges, and another tea themed cookie recipe from yours truly! I’m spearheading the cookie exchange at my work this year, so I just had to create something new – my colleagues are starting to have expectations! This is my third year working on my unit, and this is my third cookie recipe on One More Steep! Previously, I shared my recipes for Earl Grey Shortbread Cookies and Matcha Sugar Cookies. I’m a huge fan of chocolate chip cookies, and I just could not resist changing it up by adding matcha! 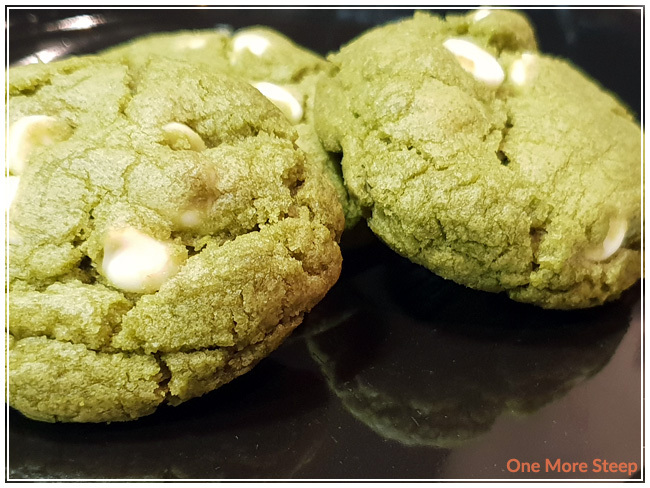 These cookies have a crunchy exterior with a melt-in-your-mouth inside that is bursting with white chocolate sweetness and matcha goodness. It genuinely reminds me of a matcha latte – and I’m loving it! If you’re a fan of matcha, this is the cookie for you. 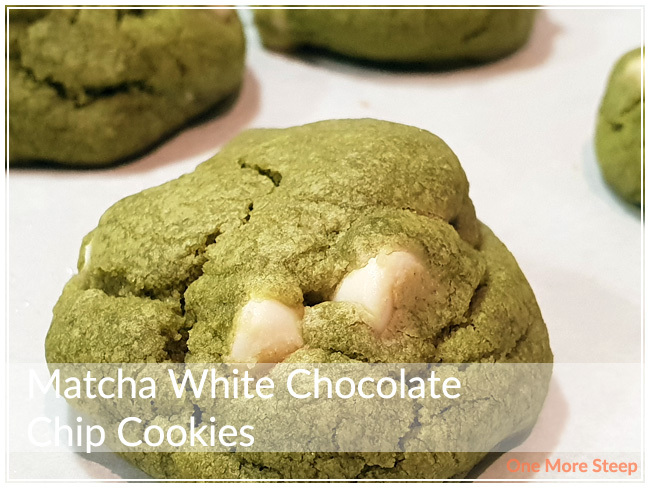 If you’re a fan of matcha lattes, white chocolate chips, or cookies in general – this is also the cookie for you. Recipe Yields: 3 dozen. Baking Time: 12 minutes. * I used a full bag of Hershey’s Chipits White Chocolate Chips (225g) with each batch, which is just a smidge over 1½ cups. You can use or more white chocolate chips according to your personal preference. Wanting to make this recipe vegetarian/vegan friendly? It’s easy! Substitute with vegan butter (or margarine), aquafaba (3 tablespoons of aquafaba is equal to 1 whole egg; aquafaba is the fluid from canned chickpeas! ), and look for dairy-free white chocolate chips (they do exist!). Beat sugar, butter, vanilla extract, and egg together until well blended. Mix in flour, baking soda, and matcha until evenly green. Stir in white chocolate chips (I found this easier to do with my hands). Roll dough out into balls that are approximately the size of a rounded tablespoon, lay out cookies at least 2″ apart as these cookies will spread. Bake 12 minutes or until edges are light brown. Allow cookies to cool for 1-2 minutes before transferring to cooling racks. Recipe adapted from Betty Crocker The Big Book of Cookies, “Chocolate Chip Cookies”. 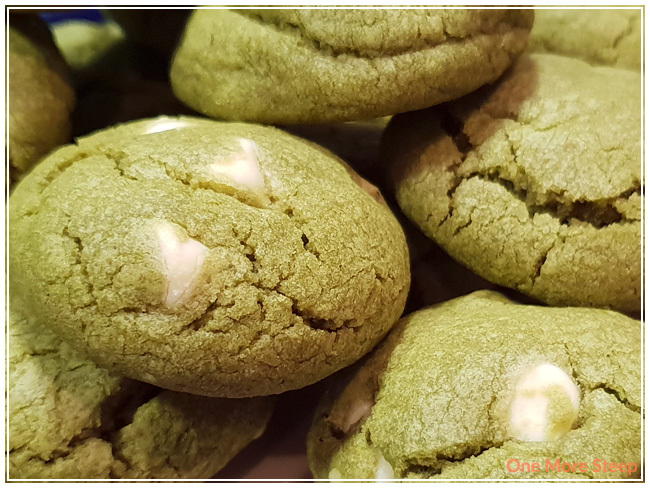 If you make these delicious Matcha White Chocolate Chip Cookies, I’d love to see your photos! Be sure to tag me on Instagram (@onemoresteep #onemoresteep) or comment below with a link to the photo!